The best way to cook this Eggplant is to fry with mince pork, salted bean, Chili/Garlic and sweet basil. You can also do sauté with tomato and chili in Vegetarian dish. I also like them when dipped in egg and deep fry for adding to other vegetable in Shrimp paste dip. We can also grill them to make Grilled Eggplant Salad ( Yam Ma Kuea-yaw) . 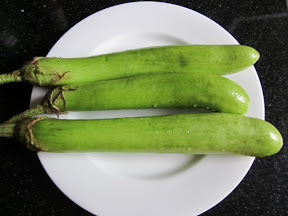 I love this long green eggplant compared to other eggplants, when cooked it will be soft and the taste is sweet.